Solid geometry is concerned with three-dimensional shapes. 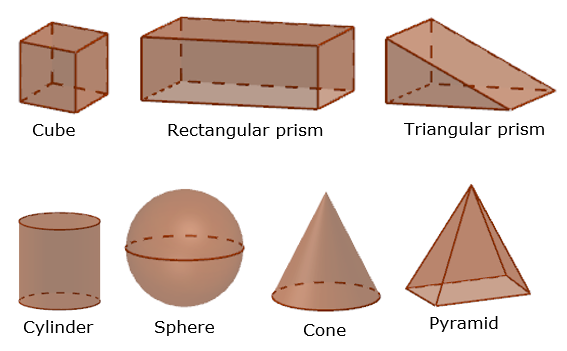 Some examples of three-dimensional shapes are cubes, rectangular solids, prisms, cylinders, spheres, cones and pyramids. We will look at the volume formulas and surface area formulas of the solids. We will also discuss some nets of solids. The following figures show some examples of shapes in solid geometry. Scroll down the page for more examples, explanations and worksheets for each shape. 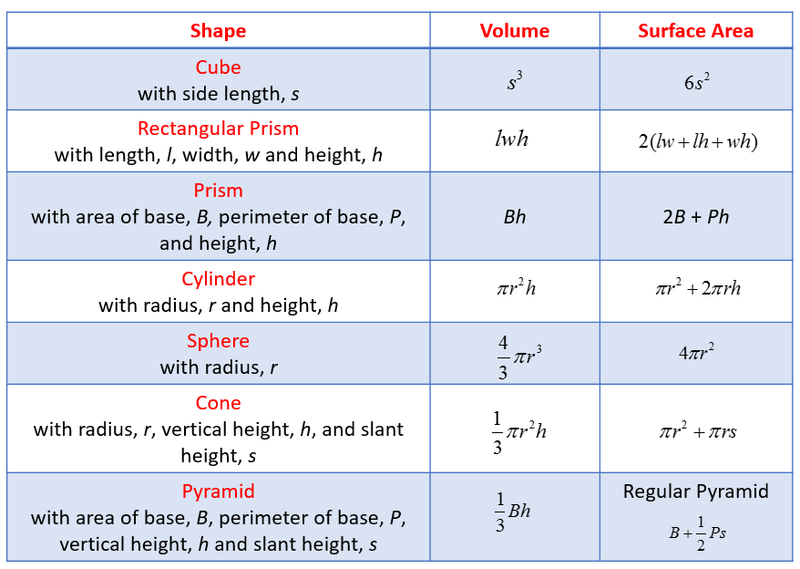 The following table gives the volume formulas and surface area formulas for the following solid shapes: Cube, Rectangular Prism, Prism, Cylinder, Sphere, Cone, and Pyramid. A cube is a three-dimensional figure with six matching square sides. 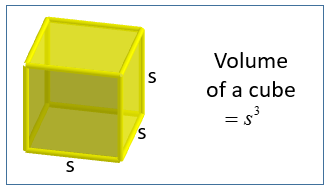 The figure above shows a cube. The dotted lines indicate edges hidden from your view. The area of each side of a cube is s2. Since a cube has six square-shape sides, its total surface area is 6 times s2. A rectangular prism is also called a rectangular solid or a cuboid. In a rectangular prism, the length, width and height may be of different lengths. A prism is a solid that has two congruent parallel bases that are polygons. 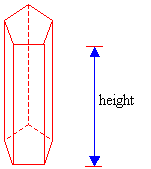 The polygons form the bases of the prism and the length of the edge joining the two bases is called the height. The above diagrams show two prisms: one with a triangle-shaped base called a triangular prism and another with a pentagon-shaped base called a pentagonal prism. A rectangular solid is a prism with a rectangle-shaped base and can be called a rectangular prism. The volume of a prism is given by the product of the area of its base and its height. The surface area of a prism is equal to 2 times area of base plus perimeter of base times height. A cylinder is a solid with two congruent circles joined by a curved surface. 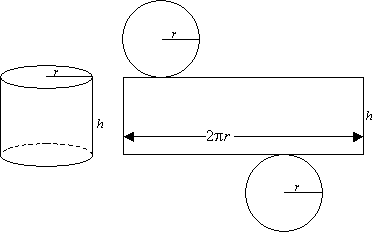 In the above figure, the radius of the circular base is r and the height is h. The volume of the cylinder is the area of the base × height. The net of a solid cylinder consists of 2 circles and one rectangle. The curved surface opens up to form a rectangle. A sphere is a solid with all its points the same distance from the center. A circular cone has a circular base, which is connected by a curved surface to its vertex. A cone is called a right circular cone, if the line from the vertex of the cone to the center of its base is perpendicular to the base. The net of a solid cone consists of a small circle and a sector of a larger circle. The arc of the sector has the same length as the circumference of the smaller circle. A pyramid is a solid with a polygon base and connected by triangular faces to its vertex. A pyramid is a regular pyramid if its base is a regular polygon and the triangular faces are all congruent isosceles triangles. An area of study closely related to solid geometry is nets of a solid. Imagine making cuts along some edges of a solid and opening it up to form a plane figure. The plane figure is called the net of the solid. The following figures show the two possible nets for the cube. How to calculate the volume of prisms, cylinders, pyramids and cones? Examples to show how to calculate the volumes of prisms, cylinders, pyramids and cones. How to calculate the surface area of a pentagonal prism with the base edge of 6 and height of 8? How to calculate the surface area of cylinders, pyramids and cones?